"Could you take a picture of me learning German on my phone?" I've wanted to learn a second language my entire life. I've always really struggled with it, though, for various reasons. To spare you the details, I've recently concluded that learning a language in the traditional classroom environment is really not for me. Each time I've tried, it hasn't gone well at all, and I usually excel at anything academic. 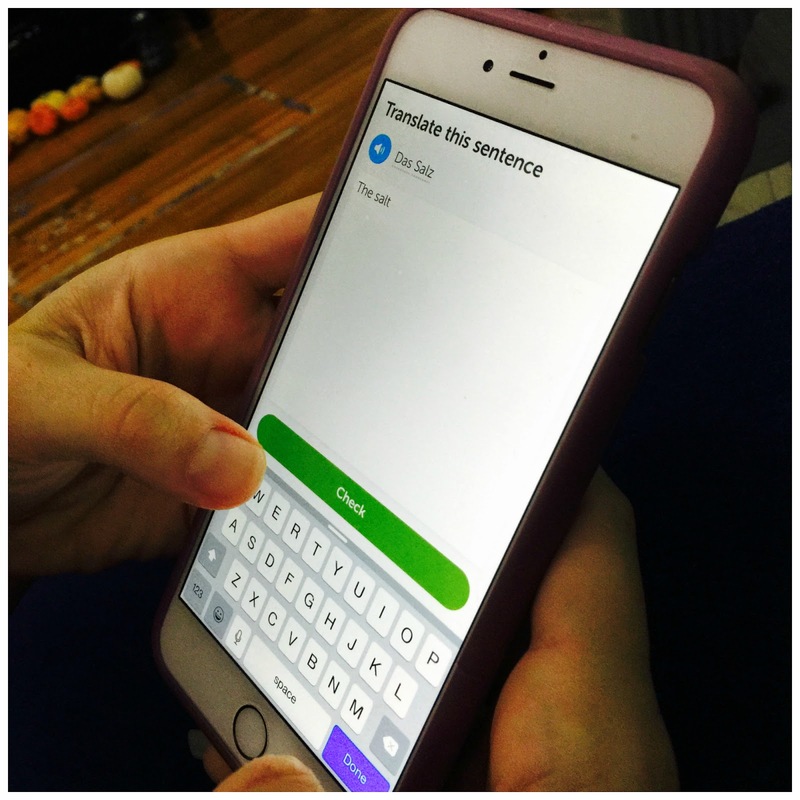 I think the methods for teaching language in a classroom setting aren't for everyone -- looking at giant lists of verbs and vocabulary and conjugations is a great way to learn a lot of words, but not context. And the social nature of classroom learning is a killer for me. Social anxiety and fear of screwing up in front of everyone? The worst. It's really not that surprising that I didn't learn easily in that environment. In the past, I took a year of Japanese (sophomore year of high school) and the equivalent of 3 years of Italian (taken in three college quarters at UCLA during my senior year of high school). The Italian experience left me feeling incredibly defeated and humiliated, and I pretty much gave up after that point, doomed to never learn a foreign language, forever jealous of those who learned more easily than I, or were born in another country and knew several languages. Dutch people, I'm looking at you! If only I were so fortunate. But no. In the US, learning a second language is tolerated, but not really even encouraged, still. Anyway. So I gave up. But you know me. Even if I say I've given up, I never really give up. Last year, when I went to Germany, I didn't actually have to know German to get along fine. Pretty much all Germans know English, some fluently, and I got lazy about learning language-related things before or even during the trip. I'd never experienced anything like that before. And then you know the rest of that story: I fell in love with Germany, and I listen to a ton of German music, and I learned that German is a language much more my speed than a romance language like Italian or French. So much of English comes from German. German is an orderly language. You say what you mean and mean what you say (the opposite of a romance language, ha). 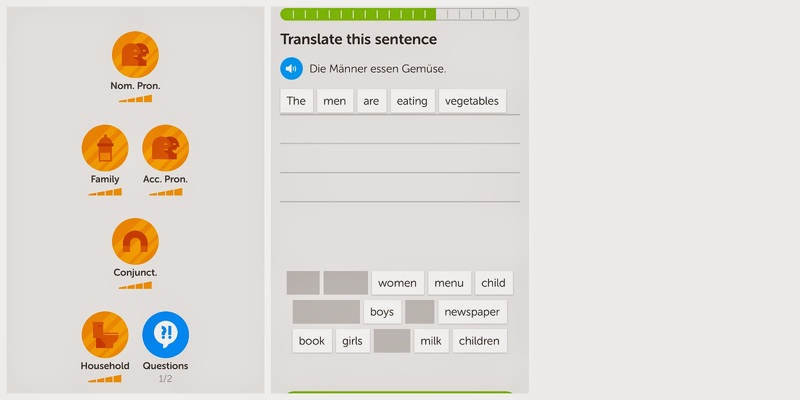 I wanted to learn German. Badly. Gabe told me to try out the Duolingo app about three months ago, after I expressed my desire to learn German for the eight billionth time. I took his advice and started learning. Since then, I've been extremely diligent about it. 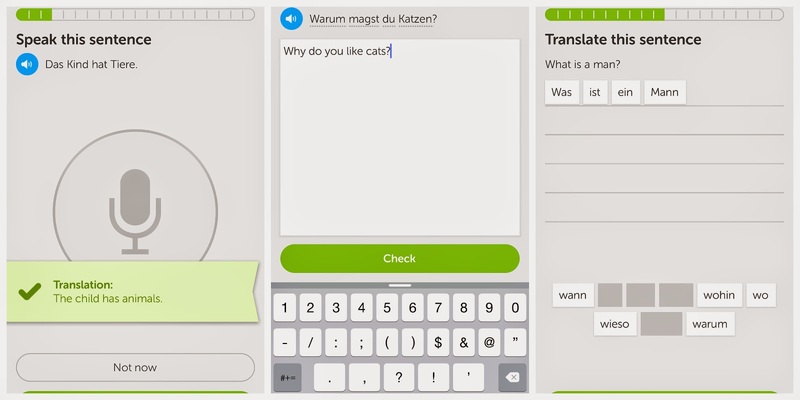 I realize that realistically I can't learn a language fluently from an app, of course. An app may have good marketing and try to convince us that it can move mountains, but in the end, it's just an app. One piece of the puzzle. I recently read a post on Quora asking "Could one learn German in a year?" Also on Quora is "How effective is Duolingo in learning a language?" Note that the second post is actually answered by one of the creators of Duolingo, so take that with a grain of salt. Anyway, all of that is just to point out that I know what I'm getting into and I have realistic expectations. If I were actually speaking German to a person, I'm sure I'd totally screw it up. It would go so fast. I'd be scrambling to remember what I know. But that said, so far I've noticed a lot of really interesting things. I do have major retention, practicing every day. I love the way I learn vocabulary -- by what it's about, rather than giant sheets of verbs and nouns and conjugations. It's an intuitive way of learning sentence structure, which so far has worked far better for me than having parts of speech written on a board and having to think of that when constructing a sentence. In other words, I'm learning rules in a roundabout way, and my brain likes that so much more. Also, it's making me much more aware of how German is similar and different from English. It's great that our languages are so closely related. And since I listen to a ton of German music, have many German friends, and watch a lot of television with references to German history, I've really had a chance to start using my newfound knowledge, and I've seen real increases in my comprehension. It's very motivating, and a ton of fun. In a lot of ways, my issues with learning language seems to be connected to my issues with learning math. The way math is typically taught in the US, it's shoved down your throat without any context or real world applicability. Context and reason is everything, when it comes to me and learning. If I don't understand the bigger picture, it's all over. But of course, my motivation is high to learn German right now, and that counts for a lot, too. And the fact that I get to practice every day reading German online and listening to music really helps.